U.S. Census Bureau export data for November was slated to be released at the beginning of January, but the federal government shutdown delayed it a month. Year-end figures for 2018 are now scheduled for release next month. 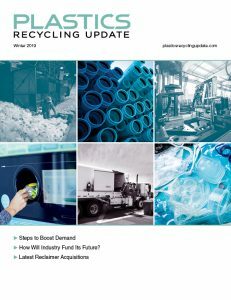 In November, scrap plastic shipments from the U.S. totaled 144 million pounds, their lowest November volume since 2003. It’s a particularly steep drop from November 2017, when exporters shipped 251 million pounds. In contrast to plastic, recovered paper exports in November had rebounded from the initial market shocks caused by China’s import restrictions. U.S. exporters shipped 1.9 million short tons of recovered paper in November, representing the second highest volume exported in 2018. The figure is 16 percent more than was exported in November 2017. China remains the largest importer of U.S. recovered paper.